Languedoc-Roussillon stretches along the Mediterranean to provide a fantastic climate and a coastal setting. It also stretches inland with the department of Lozère (France's least densely packed department). 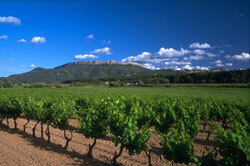 Languedoc-Roussillon produces wine in abundance - it has the largest production of any area in Europe. Running through the centre is the Canal du Midi, the region also benefits from several national parks and the peaks of the Pyrenees which form part of the course of the Tour de France. The region is noted for its relaxed pace of life (probably a result of the stifling hot summer temperatures). Hot and dry, and in some places windy too! Of course being so far south means that generally the weather is hot and dry - but the area is also famous for the strong cold and often rain bearing winds of the Tramontane and the Mistral. A popular place for tourists and non-tourists! Communication links are good - not only to the UK but also to Spain and Italy. The region is a very popular tourist destination with large stretches of the coastline housing hotels, campsites and blocks of self catering accommodation. The area has the fastest growing population of any area in France. Property is increasing in price in this area but is still very much cheaper in general than in neighbouring Provence-Alpes-Côte d'Azur. For those of you who would be interested in learning a little more about the Languedoc-Roussillon from an insider's point of view, you may like to look at an additional article we have which also gives advice on potential property hotspots! Languedoc-Roussillon Property - Insider's Guide. Do you know Languedoc-Roussillon better than we do? 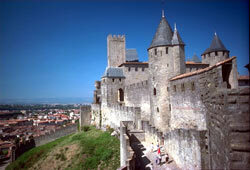 Do you have photos of Languedoc-Roussillon? The Gard is the most easterly department in Languedoc-Roussillon and comprises the major towns of Nîmes, Uzes, Ales, Remoulins and Bagnols-sur-Ceze. Despite being a mainly inland area, the Gard has 18km of sandy coastline on its southern tip. The Hérault, department number 34, is located in the South of France on the Mediterranean coast and has a fantastic year round climate. It is famous for its full bodied red wines and for its oyster beds along the coast in the Bassin de Thau. Lozere is a haven for those wanting a Languedoc life without the tourists so evident nearer the coastline. It is France's least populated department and is about as close as you can get to traditional French living. Lozere is the most northerly department of the Languedoc Roussillon and its population is around 130,000. Heavily influenced by Spain, the sunny Pyrénées-Orientales is a fascinating department. Combining sandy beaches, rocky coves, picturesque harbours and mountainous inland areas, this department really does have something for everyone. The ancient village of Abeilhan is found in the sunny Hérault department of the Languedoc Roussillon region in the south of France. Abeilhan is a traditional "circulade" village, with the ancient fortified walls forming a defensive circle around the historic centre. The village bases its economy on wine production, with the vineyards that surround it providing a strong clue to its raison d'etre. Agde, the second oldest town in France, is known as the Black Pearl of the Mediterranean due to the black basalt (a relic of its volcanic past). You'll see it used in the buildings of the town and it's also responsible for the beautiful and unusual black sand beaches that characterise the area. The town of Aigues Mortes is located in the central-south of France, in the beautiful wetlands known as the Camargue. Aigues Mortes is beautiful in its own right, and holds a historical fascination due to its rich past and magnificent city walls that still stand proud today. Ales is the Gard departments second largest town, holding a population of around 40,000 people. The town was once heavily reliant on mining but now it is home to a wide variety of sporting activities applicable to all seasons of the year. The old and charming village of Alignan du Vent lies in the delightful landscapes of the Hérault department of Languedoc-Roussillon in the south of France, among the vineyards and mediaeval castles of this historic and beautiful region. There is a distinctly Spanish air about the town of Amelie-les-Bains-Palalda, despite the fact that it is found in France. You may spot posters advertising bullfighting, and you will definitely hear a language that is not French. Catalan to the core, Amélie-les-Bains-Palalda sits in the southernmost department of France, up against the Spanish border. The town is overlooked by the mighty Mount Canigou, which is the eighth highest mountain in France. Anduze is a charming mediaeval village lying in the foothills of the Cévennes Mountains in southern France. Known for its position as the gateway to the Cévennes, it is nevertheless just an hour's drive from the Mediterranean Sea. Argelès Plage, literally translating to Argelès Beach, is the seaside part of the town of Argelès sur Mer, which is found in the Pyrénées-Orientales department of the Languedoc-Roussillon region of southern France. This is by far the most celebrated beach resort of the region as it is quite superb, with mountains visible in the background, with the beaches being clean and sandy and backed by beautiful pine trees and palms in addition to offering excellent facilities for holidaymakers of all ages and tastes. Argelès-sur-Mer is a charming typical Catalan village on France's Mediterranean coast. There are two parts to the town, with the old quarter being situated further inland than the newer, more tourist-orientated beach area. The mediaeval town of Arles sur Tech sleeps under a southern sun in the south of France, close to the border with Spain. Set against a dramatic backdrop of the Pyrénéan Mountains, Arles sur Tech is a great place to surround yourself with the majesty of nature, whilst remaining close to important cities and fascinating historic places to visit. Autignac, in the southern wine producing region of Languedoc-Roussillon, is a truly lovely village which sits in the midst of acres and acres of picturesque vineyards. If you enjoy wine and sunshine, Autignac could be close to paradise on earth! The village of Axat lies in the southern department of the Aude, in Languedoc-Roussillon. Axat is close to the border with the neighbouring department of Pyrénées-Orientales, and also not far from Spain and Andorra. The town has a dramatic setting, with the rushing melt waters of the River Aude dashing through, making it a paradise for white water sports enthusiasts. Azille is a lovely, historic village which is located in the Aude department of Languedoc-Roussillon, in central southern France. Although lying slightly inland, Azille is within easy reach of the coast, and is Mediterranean through and through, with its old, stone houses, terracotta roofs and the surrounding vineyards of the Minervois wine region. Bages is one of the Aude department's secret gems, known to few but loved by all those who discover it. A small fishing village on the Mediterranean coast set in the central south of France in the Languedoc-Roussillon region, Bages is full of the sort of colour and character that marks it out as very, very special. Bages is an attractive Catalan village that's situated not far from the bustling city of Perpignan in the department of the Pyrénées-Orientales in southern France. With almost year round sunshine and being set a few short kilometres from the lovely Mediterranean coast, Bages is a good choice for a base for holidays. Situated North-East of Uzes, Bagnols Sur Ceze is widely considered to be the gateway to the Languedoc. The town has a population of about 18,000. It is near the border with two other regions - Provence and the Rhone Alps. Its strategic location makes it an ideal base for touring the many notable places of interest in the three regions. The historic village of Balaruc le Vieux is found in the Mediterranean department of the Hérault, in the region of Languedoc-Roussillon in the south of France. A "circulade" village, built in the defensive style unique to this region, Balaruc also sits on the edge of the salt water lagoon known as the Etang de Thau, beside the Mediterranean coast. Balaruc les Bains is something a little bit special, even in this sunshine blessed region of Languedoc-Roussillon. Set beside the Mediterranean Sea on the lovely saltwater lagoon of the Etang de Thau, close to the vineyards and historic towns of the Hérault, Balaruc les Bains is not just a charming seaside resort but also a Thermal Station of the highest quality. The peaceful and pretty village of Banyuls dels Aspres is located in the south of France, in the department of the Pyrénées-Orientales in southern Languedoc-Roussillon. Banyuls dels Aspres is surrounded by the vineyards that are the mainstay of its economy, and is ideally located for exploring either Catalan France or Catalan Spain, which lies just some ten miles to the south-west. The town of Banyuls sur Mer is located on the gorgeous Mediterranean coast in the deep south of France, close to the Spanish border. The town, essentially a fishing village, not only rejoices in a beautiful coastline and climate, but also has a dramatic setting with the wine clad foothills of the majestic Pyrénées climbing steeply up from the town. The town of Barjac is located in the central-south of France, in the most easterly of the departments of the Languedoc-Roussillon region, the Gard. Lying amongst a very Provençal scene of olive groves and vineyards, the town is referred to as being in the Gard Provençal, despite not actually falling within the boundaries of Provence. This Renaissance town is both historically and culturally important, as well as being a place of great beauty. The town of Bedarieux, while having an enviable spot on the Mediterranean, contains a number of bargains waiting to be snapped up. The village of Belpech is found in the region of Languedoc-Roussillon, in the centre south of France. Dating back to Gallo Roman times, the little village has plenty of heritage to discover, and lies in lovely countryside close to many attractions. At a glance Belvèze du Razes is a small village situated in the lovely countryside of the Aude department, near to the mediaeval city of Carcassonne. Set amid the rolling foothills of the Pyrénées, breathtaking views of the mountains can be seen from the village. The town of Bessan is situated in the south of France, in the Hérault department of the Languedoc-Roussillon region. Lying just a short way inland from the famous Cap d'Agde, the tranquil and traditional Bessan couldn't be more different from its brasher sister. The village of Bize Minervois is one of the prettiest villages to be found in the Languedoc-Roussillon region of southern France. Set in the department of the Aude, the village lies amid the vineyards of the Minervois wine region, at the foot of the lovely Montagne Noir, or Black Mountain. Bompas is a Catalan market town that is located in the south of France, in the Pyrénées-Orientales department of Languedoc-Roussillon. Lying close to the beaches of the Mediterranean in one of the warmest and sunniest parts of France, Bompas is also near the ski resorts of the Pyrénées, and thus makes a perfect base for holidays. The wine village of Boujan sur Libron is found close to the historic city of Béziers, in the lovely countryside of the Hérault department of Languedoc Roussillon. Boujan sur Libron is attractive and authentic, retaining many of its original houses and traditional buildings, yet it has a thriving community life and is well equipped with shops and other amenities. Bouzigues, which is located on the coast of Languedoc-Roussillon in the south of France, is also known as the oyster capital of the south. It is set on the edge of the Étang de Thau, that fascinating stretch of inland sea or lagoon that graces the Mediterranean coast in this region, which is rich in oysters and other shellfish. The town of Bram is found in the Languedoc region of southern France. It is an interesting and distinctive town, particularly when viewed from the air, as it is built in a circular pattern, originally as a defence against invaders. Bram is fortunate to be situated on the lovely Canal du Midi, which links the Atlantic Ocean to the Mediterranean Sea. The town of Cabestany is a close neighbour of Perpignan, so close, in fact, that it is sometimes considered to be the southern part of the city. Similar to Perpignan, Cabestany is in an ideal location for access to the lovely beaches of this part of the Mediterranean, and makes a fantastic place to live, whether full or part-time. The seaside resort of Canet en Roussillon is located on the pretty stretch of Mediterranean coast that lies in the deep south of France, close to the Spanish border. Long established as a favourite summer retreat for the French, the town nowadays is popular with foreigners too, unsurprisingly really, as it has lovely safe sandy beaches, great weather and a picturesque setting near the Pyrenean mountains. The town of Canet Plage is a popular and elegant seaside resort that lies in the south of France, in the region known as French Catalonia. Originally just known to the local people, Canet Plage is now a sophisticated summer centre attracting holiday makers from all over Europe. Cap d'Agde is known to many as the Languedoc's premier seaside resort. Not to be confused with the ancient town of Agde, "the Cap", as it is referred to, is an altogether livelier affair, remarkable for its black sand beaches and naturist areas. Cap d'Agde is located in the south of France, in the department of the Hérault. The delightful little town of Capestang is located in the south of France, in the Hérault department of the Languedoc-Roussillon region. Less than half an hour away from the superb beaches of the Mediterranean, Capestang is full of history yet also manages to offer all mod cons and to cater for the tourist trade without ever relinquishing its genuine charm. Find out why this magical town in the Languedoc Roussillon continues to amaze visitors from all over the world. Do you know which animated film was based on this town? A vital round-up for those considering property in the area. All the essential travel details are covered. Castelnaudary is a small town situated in the Languedoc-Roussillon, not far from Carcassonne. It is home to much tradition and scenery. Many visitors to the town come by way of the pretty canal. One of the cheaper places in Languedoc to buy property. Caunes Minervois is one of the Languedoc's prettiest mediaeval villages. It lies in the department of the Aude, in the central south of France, not far from the Mediterranean Sea, and is highly sought after both as a location for property purchase and as a holiday destination. Caunes Minervois has a number of historic sights in addition to other attractions such as shops and restaurants. If a peaceful life under a brilliant sun appeals to you, the little wine making village of Causses et Veyran in the Languedoc region in the south of France could be just the place for you. Traditional in every way and set in the middle of the extensive vineyards that characterise the Hérault department, Causses et Veyran is as pretty as a picture. The tiny little village of Caussiniojouls, in the wine rich, sun-drenched Hérault department of southern France, is hugely charming, with its mediaeval houses and narrow, cobbled streets. Its location, near to the Cathar city of Béziers and the fabulous Mediterranean Coast, is perfect for lovers of the sea, the countryside and the historic cities of France's south. Perfect, in fact, for everyone! The historic village of Caux lies in the Hérault department of the sun-soaked Languedoc-Roussillon region in the south of France. Set in glorious surroundings of vineyards and woodlands with a backdrop of misty mountains, Caux is within easy reach of the Mediterranean beaches, salt lagoons and fishing ports as well as close to the fascinating Cathar cities of Béziers and Carcassonne. Cazouls Les Beziers is a relaxing town just 25 minutes away from the Mediterranean Sea. It can be found, wrapped in lush countryside, in the Languedoc-Roussillon region of southern France. The town is also in the heart of the largest and most loved winemaking region in the whole of France. The town of Cerbère is located in the deep south of France, next to the Spanish border. With its bright Catalan colours glowing in the Mediterranean sunshine, this little town is a perfect spot for those who love France but like a little Spanish edge to life as well. The town of Ceret, in the southernmost tip of France, is a truly delightful example of the blend of France and Spain that is Catalonia. Nestling at the foot of Mount Canigou, the soft pink and cream coloured houses of Ceret with their red tiled roofs contrast vibrantly with an impossibly blue sky, almost all year round. Cessenon sur Orb is a village which is located in the south of France, in the sun soaked Hérault department of Languedoc-Roussillon. Sitting as its name suggests, on the River Orb, it is a place of ancient charm, typical of its area and time, and something of a Mecca for white water sports enthusiasts who love the swirling flow of the rapids. Chalabre is a town of southern France that is located in the Aude department of Languedoc-Roussillon. The capital town of the historic Quercorb (pronounced "Carecor") region, Chalabre is a beautiful bastide town, full of character and charm and set in one of the most dramatic and beautiful landscapes of France. Clermont l'Hérault is a pretty little town situated amongst the olive groves and vineyards of southern France. It lies about 30 minutes drive from the departmental capital of Montpellier, and is easily accessed from the main roads of the A75 and the A750. The quaint fishing village of Collioure, in the southernmost tip of France, is a delightful old town where the blues of the Mediterranean Sea and sky blend with the reds and yellows of the Catalan flag flying from the little fishing boats moored in the harbour. The hot sun beats down on the town in summer, making it a midday necessity and a delight to sit in a shaded restaurant looking out over the bay and lunch on delicious seafood. The Corbieres has long been a much coveted area. In the past, the area's mineral wealth was a major attraction. Today, tourists are drawn by the pretty scenery and of course by the thriving wine industry. The ancient village of Corneilhan sits in the Mediterranean department of the Hérault, in the south of France. Set on a hill in a gently undulating landscape, Corneilhan gazes out over an expanse of vineyards to the hills of the Haute Languedoc in the distance. Couiza is a small market town that is found in the Haute Vallée section of the Aude department of Languedoc-Roussillon, in southern France. The town lies on the picturesque River Aude, and glories in a stunning countryside of vineyards and mountains, being on the edge of the beautiful Pyrénées. Durban Corbières, in the very heart of the Corbières wine region in south-west France is a delightful Languedoc village where life is still dictated by the rhythm of the seasons and the care of the vines. There is a strong sense of history here, and the fact that Durban Corbières is in Cathar country means there will always be a warm welcome extended to you when you visit. The Catalan town of Elne is located in the far south of France, in the region of Languedoc-Roussillon, and in the Spanish flavoured department of the Pyrénées-Orientales. Lively and warm hearted, Elne welcomes you to discover its sunny Mediterranean weather, its rich history, its Catalan culture and its fabulous gastronomy and wines. Espéraza is a small market town which is found in the wild and beautiful countryside of the Aude department in Languedoc-Roussillon. Widely known as "the other south of France", this region is rich in history and natural beauty, yet unspoilt by tourism. Espéraza is typical of the area, with mellow stone houses, a sleepy air and a stunning setting near both the Pyrénéan Mountains and the Mediterranean Sea. The little village of Espondeilhan lies under the warm, southern sun and blue skies of the Languedoc region of central southern France. Surrounded by the vineyards that create the delicious wines of the region, and not far from the blue waters of the Mediterranean Sea, Espondeilhan is a tranquil and pretty base for enjoying all the sights, sounds and scents of this historic region. The historic village of Estagel, situated in the south of France, in the Pyrénées-Orientales department, is superbly situated in dramatic countryside, and provides a paradise for both wine lovers and adherents of adventure sports. Estagel is a tranquil and pretty place, with mellow stone houses sleeping in the sunshine, and a way of life that seems to have remained largely unchanged for centuries. Fanjeaux lies close to all the best bits of the Aude department in Languedoc-Roussillon (Carcassonne is just fifteen minutes away), and on the edge of the wild beauty of the Ariège. So, it's uniquely placed to offer a perfect base for holidays (or a new life) in southern France. The village is also packed with history and is absolutely charming. Faugères is a typically Languedocienne town, with its main street lined with big plane trees, pruned into stark shapes for the winter yet generously leafy in summer, providing welcome shade. Lying in the south of France, just near the historic town of Béziers, Faugères is famed for its superb wines. The village of Fitou, which is situated in the far south of the Aude department in southern France, is a small village with a huge reputation for producing excellent wine. Fitou lies between the rocky slopes of the low Corbières and the blue Mediterranean Sea, and is an authentic and pretty southern village which has a charm all of its own. The town of Fleury, or, to give it its full title, Fleury d'Aude, is an historic wine village that is situated in the vineyards of the south of France, in the Aude department. Once strongly fortified, Fleury lies below an old chateau that sits on the hillside above the town, just at the foot of a small mountain range known as the Massif de la Clape. Despite its mountainous surroundings, Fleury actually lies only minutes from the Mediterranean Sea, and the seaside town of St Pierre de la Mer. The village of Florensac is found nestled in the lovely countryside of the Hérault department, in southern France. Florensac is a paradise for wine lovers, as the village is surrounded by vineyards, and also lies close to the lovely inland sea or lagoon known as the Bassin de Thau, where delicious oysters and other seafood are found and brought fresh to your table. Font Romeu Odeillo Via is a fascinating and lively town set in the majestic landscapes of the Pyrénéan Mountains in the south of France. The site of the largest solar furnace in the world, Font Romeu Odeillo Via is also a paradise for skiers and all sports fans, having a wonderful natural environment and a multitude of activities on offer, whatever the season. Formiguères is a small and friendly ski resort set in the unspoiled beauty of the French Pyrénées, in the department of the Pyrénées-Orientales. The little town is lively and offers simple but good facilities, with music bars, restaurants, shops and services. Fouzilhon is a charming, circulade village that lies amid the vineyards of the Hérault department of the Languedoc-Roussillon, in the centre south of France. The village is close to the historic town of Pezenas, and within easy reach of the coast and the best attractions of southern France. Frontignan is a picturesque town which is found in the central south of France, in a delightful setting beside the Rhone-Sète Canal and the Mediterranean Sea. It is essentially a town of two halves, with a seaside area, known as Frontignan Plage, and an inland main town. Popular with holiday makers, the town is lively in summer yet calm in winter, and is close to many of the attractions of the area. The village of Gabian, which is located in the south of France, close to the Mediterranean Sea, is a traditional "Circulade" village, built, as its name suggests in a circular layout to protect it from invaders. Pretty and historic, the village is surrounded by the vineyards which are the economic lifeblood of the area, and is well placed for further exploration of the Cathar cites of Carcassonne and Béziers, as well as the beautiful hills and valleys of the Hérault. Goudargues is a beautiful town that is found in the south of France, in the department of the Gard, close to the ancient city of Nîmes. The town is often likened to Venice, due to the canals that drift through, and is indeed a very picturesque and peaceful place to soak up the Mediterranean sunshine and ambience. The charming town of Gruissan, with its beautiful sandy beaches, fishing port and marina, lies under southern skies in the central south of France, in Languedoc-Roussillon. Noted for its excellent seafood restaurants and lively atmosphere in the holiday season, Gruissan is both historically interesting and extremely picturesque. Hérépian is an interesting and attractive village, set among some of the most productive vineyards in France. It sits at the confluence of two rivers, the Orb and the Mare, and is a most attractive place, being made up of pretty stone houses and old churches. Ille Sur Tet is a typically French Catalan walled town, sitting in the shadow of the mighty Mount Canigou. Situated in the most southerly department of Languedoc-Roussillon, Ille Sur Tet benefits from long hours of sunshine and a climate that is definitely Mediterranean! The circular village of Issirac is found amid the gorgeous landscapes of the Gard Provencal, in the south of France. Issirac is bursting with charm, but its real glory lies in the views that its 282-metre altitude provides, taking in lavender fields, vineyards, almond and cherry orchards and mountains. La Franqui is a delightfully old fashioned seaside resort which lies on the Mediterranean Sea in the central south of France. With a lovely beach, backed in part by a pine forest, La Franqui is the perfect seaside destination for families, and for anyone who appreciates this unpretentious and thoroughly genuine piece of the Mediterranean. The town of La Grande Motte is found in the northern Languedoc, in the popular Mediterranean department of the Hérault. On a stretch of the Med that is sometimes dubbed the "New Riviera", it is a modern, purpose built resort with a jet set feel, superb sandy beaches and all the sun and fun of the original Riviera, just a little further to the east. The ancient village of Lagrasse, which lies in the department of the Aude in the far south of France, is reputed to be one of the most beautiful villages in the country. Appearing to be straight from a film set, the River Orbieu meanders idly by the mediaeval walls of the old town, whilst in the background the hills rise in wild Mediterranean splendour. Lamalou-les-Bains is a very pretty small spa town set in the beautiful National Park of the High Languedoc in southern France. It not only benefits from its superb setting, but also from its natural hot springs which have boosted the economy for many years. Lamalou-les-Bains makes a great base for exploring and enjoying this beautiful region. Laroque des Albères is a picturesque and character filled Catalan village that is located in the foothills of the Mediterranean Pyrénées, in the beautiful department of the Pyrénées-Orientales, in the Languedoc-Roussillon region of the south of France. Soaking up the hot southern sun as it has done for centuries, the ancient village is set among the cork oaks and chestnut trees of Roussillon, and has the magnificent backdrop of the soaring peaks of the Pyrénées to offset its simple splendour. Latour de France is a village that is located in the south of France, in the Pyrénées-Orientales department of the Languedoc-Roussillon region. It lies amid the stunning scenery and pretty villages of the Fenouillèdes, and is popular with lovers of white knuckle sports as the landscape of mountains and gorges is a natural adventure playground. The mediaeval village of Laurens, which is located in the south of France, near the Mediterranean Sea, is a delightfully peaceful place, where life seems to continue as it has for centuries, undisturbed by the pressures of the modern world. Set in the lovely Mediterranean landscapes of the Hérault department of Languedoc-Roussillon, Laurens is the perfect place to kick back and relax, and to find a quality of life that you thought had ceased to exist. With its three weekly markets, abundance of long golden beaches, Mediterranean sunshine and lively summer atmosphere, Le Barcarès has to be close to everybody's ideal French seaside town. Situated in the Roussillon region of the far south of France, close to the Spanish border, Le Barcarès benefits from its proximity to both Med and mountains, and offers fantastic sporting opportunities as well as the usual "beach and bars". Le Boulou is an historic Catalan spa town that is found on the French side of the France\Spain border, in the Languedoc-Roussillon department of the Pyrénées-Orientales. Although Le Boulou is not a large town, it has great amenities and plenty of leisure activities on offer too, so true to Catalan traditions, you will never be bored! Le Grau d'Agde is the fishing port situated in the south of France, at the point where the River Hérault finally meets the Mediterranean Sea. Close to, but very different from its well known party animal neighbouring town of Cap d'Agde, Le Grau d'Agde is quieter, smaller and far more traditional. Les Angles is a ski resort tucked into a beautiful corner of France... that is very nearly a corner of Spain. Hence, you will hear as many Spanish voices as French ones on the slopes... and a good few other languages too, including English, as the resort is one of the best and most popular in the eastern Pyrénées. The village of Leucate, which lies in the south of France on the Mediterranean Sea, is a delightful old village, full of history and colour. With its cobbled streets and village houses with gaily painted shutters, Leucate has a truly Mediterranean ambience. Leucate Plage is found in the south of France on the Mediterranean coast, and is one of six areas which make up the town of Leucate itself. It consists of eighteen kilometres of golden sandy beach, and is popular with paragliders and windsurfers. The town of Lézignan-Corbières is situated in the heart of the Languedoc-Roussillon wine region, in the prolific vineyards of the Corbières. This bustling market town provides everything you need for a comfortable modern lifestyle, whilst surrounding you with history and tradition. The wine village of Lieuran lès Béziers is located in the central south of France, among the vineyards of the Hérault department of Languedoc-Roussillon. Lieuran lès Béziers is pretty and peaceful, yet with excellent local amenities. It occupies an enviable position halfway between the Mediterranean Sea and the beautiful Cevennes Mountains, a position which is renowned as an area of outstanding natural beauty and a haven for adventure sports enthusiasts. Lignan sur Orb is village which can trace its history back some one thousand years. It is found in the south of France, in the Languedoc-Roussillon region, close to the historic city of Béziers, centre of the tragic Cathars. The village is sited in a magnificent position between the Cèvennes Mountains and the blue Mediterranean Sea and offers a prime location for anyone wanting to settle or holiday in this fabulous area. Located in the deep South of France, Limoux's blissful climate is a luring attraction. Together with a low crime rates and a cheap cost of living, it has proven itself to be a popular destination for those looking for a place on the Mediterranean. The lovely market town of Lodève is found in the Hérault department of the south of France. Set in a countryside of olive groves, vineyards, rivers, mountains and lakes, Lodève is also within easy reach of the Mediterranean Sea. The mediaeval walled village of Lussan is found in the stunning countryside of the Gard department in Languedoc-Roussillon. This part of the Gard is often referred to as the Gard Provençal as it shares many characteristics with Provence. Magalas is a charming village set on France's magical Mediterranean coastal plain. With a typically warm, sunny climate and inherent charm, Magalas is a 'must see' for anyone considering buying property in South West France. The little town of Maraussan lies in the Hérault department of the sunny Languedoc-Roussillon region in southern France. Set in a stunning location, with the Haut-Languedoc National Park to the north and the beaches of the Mediterranean to the south, Maraussan also benefits from lying in the largest... and arguably, most picturesque wine region in France. Margon is a delightful mediaeval village that is located in the south of France, in the department of the Hérault. Built along the defensive principles of a circulade (a circular, walled town or village), the village still retains many original features, including some parts of the ancient walls which can be seen today. Margon is set in the very Mediterranean landscapes typical of the region, including productive vineyards, beautiful hills and olive trees. Marseillan is gorgeous. There is no other way to describe this town in the southern French department of the Hérault, down on the Mediterranean coast. An ancient fishing port of immense charm, it lies on the shores of the Étang de Thau, which is a salt water lagoon separated from the Med by a strip of land. Marseillan Plage is a lovely and lively beach resort in the south of France, on the Mediterranean Sea. It is connected to, although not to be confused with, the old port town of Marseillan, which lies a short way inland of Marseillan Plage, on the Étang de Thau. Marseillan Plage is very much a holiday resort, with great facilities and perfect for those wonderful summer holidays when all you want to do is relax and have fun in the sun. Maureillas las Illas is a lovely Catalan village that lies in the far south of France, in the Pyrénées-Orientales department of the region of Languedoc-Roussillon. The village, just a stone's throw from the Spanish border, is idyllic. It is tranquil and traditional, yet close to the lively market town of Céret and all the attractions of the Mediterranean coast and the Pyrénéan Mountains. The lovely little wine village of Maury is found in the peaceful and often dramatic countryside of the Pyrénées-Orientales department of the Languedoc-Roussillon region in the south of France. It lies at the edge of the Pyrénéan Mountains, not far from the border with Spain and just a stone's throw from the awe-inspiring ruins of Cathar castles and jaw dropping natural gorges (not to mention the Mediterranean Sea!). Maury is perfectly placed to bring a real flavour of this fascinating area. Mèze is a lovely old village that lies on the "inland sea" of the Bassin de Thau, on the Mediterranean coast of southern France. Fascinating for its ecology, it is also a rich source of seafood, especially oysters, and all this, as well as its appeal to the holiday trade, makes it an intriguing and exciting place to be. Millas is a small village situated in the far south of France, not far from the Spanish border. The village is tranquil and pretty, with stone houses baking under a hot Mediterranean sun for most of the year, and revels in its proximity to some of the Mediterranean's prettiest beaches and most dramatic mountains. The village of Minerve, which is found in the Hérault department of Languedoc-Roussillon in the south of France, is classified officially as being "one of the most beautiful villages in France", and is therefore a real property and tourism hotspot in spite of its diminutive size. It is the historic capital of the ancient Minervois region, famed for its wine, its beauty and its sunshine. Molitg les Bains is a small spa village that lies in the Pyrénées-Orientales department of the south of France, close to the Aude border. Known for its hot sulphurous springs, Molitg (pronounced "Molitch") occupies a stunning natural site. It is overlooked by a beautiful castle and gazes down into a heavily forested and quite breathtaking gorge. Montagnac is a small market town that is found in the sun-drenched Hérault department in Languedoc-Roussillon. The centre south of France is noted for its wines, its sunshine and its fascinating history and culture, and Montagnac is very typical. The town has good amenities and close enough for easy access to the coast and all the main attractions of the region. The village of Montarnaud is found amid the stunning garrigue and vineyards of the Hérault department of Languedoc-Roussillon in the central south of France. Montarnaud is a traditional village, typical of the Hérault, and has a great heritage manifesting itself in a chateau and beautiful church as well as authentic old houses, streets and character. Montbazin is a medium sized village of some charm which is located amid the vineyards and hills of the Languedoc region of central southern France. Historical and picturesque, Montbazin is ideally located for holidaying in the area, being close to the lively and cosmopolitan city of Montpellier (with excellent travel links to the UK), to the beautiful saltwater lagoon of the Etang de Thau and the Mediterranean Sea. The village of Montblanc, not the mountain in the Alps, is found in the winelands of the Hérault department of the central southern French region of the Languedoc. Nestling among the vineyards that are the lifeblood of the region, the village is a haven of peace and southern charm, and is within a stone's throw of all the major attractions of the Languedoc. Montesquieu des Alberes is a small and tranquil village set against the dramatic backdrop of the Pyrénéan Mountains in the Languedoc-Roussillon region of the south of France. It is the perfect location for walkers, with some superb trails around the village and in the mountains. The gorgeous French Catalan coast is just minutes away. Montpellier, Languedoc Roussillon's capital, is one of France's most affluent cities. It is brimming with beautiful fountains, open squares and the streets happily mix both modern and historic buildings. Property prices have risen sharply in the last five years making Montpellier one of the more expensive areas of Languedoc Roussillon. Montréal, in the sunny Languedoc-Roussillon region of southern France, is in many ways a perfect place to find your home in France. After the Mediterranean coast, where property is scarce and expensive, houses near to the fairy tale city of Carcassonne are amongst some of the most desirable for those seeking a home, permanent or otherwise, in the sun drenched south. Montréal, just 19 km from Carcassonne offers the delights of its proximity to the city along with its own inimitable rural charm. Mouthoumet is a small village that lies in the region of Languedoc-Roussillon in the south of France. Set in Mediterranean landscapes of vineyards and garrigue (rocky scrubland), the village lies near the mysterious Rennes les Châteaux, place of Cathar and Holy Grail legends, and not far from the beautiful mediaeval city of Carcassonne. Murviel-lès-Béziers, in the south of France, is an interesting old 'circulade' town, dating back many centuries. Seen from the air, the village is constructed in a complete circle, as are several others in this region, as a form of defence against invaders. The village is full of character, having narrow winding streets and pretty old houses, and is set in the beautiful countryside of the Hérault. Narbonne, close to the Mediterranean Sea in the region of Languedoc-Roussillon, is the oldest town in south-west France. With its colourful markets and the picturesque Canal de la Robine running through the heart of town, Narbonne is one of the region's loveliest cities. The resort of Narbonne Plage is a family friendly seaside resort which lies on the French Mediterranean. The resort benefits from three miles of some of the sandiest and cleanest beaches in France, and also offers a superb water sports centre which caters for all ages. Neffiès is a beautiful wine village that lies amid the extensive vineyards of the Hérault department in Languedoc-Roussillon in the south of France. Built in the traditional circular style, with the gently curving walls of its houses radiating around the central Gothic church, Neffiès is an authentic southern village, charming and welcoming. Nimes is the capital of the Gard department. It's an interesting mix of old and new, with ancient roman sites and a recent push of modern architecture. It's also a popular place for foreign buyers. Despite sounding like a Japanese car, Nissan lez Enserune is actually a very pretty and historic village that lies in the central south of France, in the Languedoc-Roussillon department of the Hérault, close to the Mediterranean. With its traditions of wine making still influencing village life, Nissan lez Enserune is visibly mediaeval and bursting with character. The picturesque village of Nizas is found against a glorious patchwork of vineyards and woodlands in the Hérault department of Languedoc-Roussillon in the central south of France. Nizas is a circulade village, a defensive construction comprising houses built in a circular pattern around the central fortified tower. The village of Olargues is found in the central south of France, in the department of the Hérault in Languedoc-Roussillon. This lovely ancient village lies in the area known as the Haute-Languedoc, a hilly and dramatic area of outstanding natural beauty. The mellow stones of the village houses, baked by centuries of sun, speak of life in a bygone age, where life was dictated by the rhythm of the seasons, and where modern day stresses did not exist. Olonzac is an old market town in the south of France not far from the Spanish border. The 'raison d'être' of the town is wine, and as it is situated in the very heart of the famous Minervois wine region you can never lose sight of this fact, with vineyards stretching around the town as far as the eye can see. Ouveillan is a Mediterranean village of great charm and southern character. It is located on a little hill in the south of France, just inland from the bustling coastal town of Narbonne in the Aude department of Languedoc-Roussillon. Ouveillan is set in typically Mediterranean countryside, with vineyards and olive groves forming a picturesque backdrop. The beautiful mediaeval village of Pailhès is found in the midst of the extensive vineyards of the Languedoc, in the department of the Hérault in southern France. Blessed by a superb, sunny climate, the village is full of a most picturesque charm and suffused with tranquillity, yet near enough to the lively resorts and beaches of the Mediterranean and close to the historic cities of Béziers and Carcassonne. The pretty seaside town of Palavas les Flots is found in the Hérault department of Languedoc-Roussillon, on the Mediterranean Coast. It's a popular little resort with much charm and offers plenty for all ages to enjoy. The resort combines ancient and modern and offers excellent facilities for visitors and residents. Perpignan is a modern, dynamic city with a fascinating history. And it's easy to reach, thanks to its international airport. This guide will provide a bit of background as well as links to find your perfect property in the Perpignan area. The town of Pezenas in the Languedoc is so steeped in history that French costume dramas are frequently found filming here. The town is very well preserved. Property prices are reasonably high and on the increase. The delightful town of Pignan is found among the vineyards and the aromatic garrigue of the Hérault department in Languedoc-Roussillon, right down in the south of France. As historic as it is picturesque, the town is near to the capital city of Montpellier and close to all the attractions of the Mediterranean coast. Pinet is a lovely old wine village set in the sun-drenched department of the Hérault, in Languedoc-Roussillon in southern France. Famed for the excellent white wine, Picpoul de Pinet, the village is picturesque, traditional and set with easy access to the Mediterranean coast, many historic sights and monuments and all the popular tourist attractions of the area. Pomérols is a picture perfect wine town that is located in the Hérault department of Languedoc-Roussillon, in the south of France. Set amongst the extensive vineyards that produce wines like the acclaimed Picpoul de Pinet, Pomérols is just a few minutes away from the Étang de Thau and the Mediterranean beaches. Pont Saint Esprit lies on the Rhone River, in the Gard department of Languedoc Roussillon. Historically important as a crossing place (hence the name meaning "bridge"), Pont Saint Esprit remains an interesting town today, and benefits from a desirable location on the borders of Provence. Port la Nouvelle is found on the Mediterranean coast, in the central southern department of the Aude. A seaside resort and fishing town, Port la Nouvelle has long sandy beaches and benefits from the superb southern climate of the Languedoc, with somewhere in the region of 300 sunshine days a year. Port Leucate is a modern port town and holiday resort that lies in the far south of France, between the Mediterranean Sea and the inland salt lake known as the Étang de Leucate. The town is popular with holiday makers and especially with windsurfers, as the location provides ideal conditions for this exhilarating sport. Port Vendres is an authentic Mediterranean fishing port and harbour that lies on the gorgeous Vermilion Coast of France, close to where France meets Spain and becomes the Costa Brava. Set against the backdrop of the stunning Pyrénées, and delightfully Catalan in character, Port Vendres is lively and colourful in the summer months, and is a fascinating place to spend time. Portiragnes is a lovely and authentic Mediterranean village that is located on the Canal du Midi in the Hérault department of Languedoc-Roussillon in the south of France. With Blue Flag beaches on the doorstep, vineyards and wine caves all around and a climate which offers some of the best sunshine in France, Portiragnes is an ideal place for a holiday or to settle down to a new and peaceful life on the Med. The seaside resort of Portiragnes Plage was created in the 1980s as a beach village with connections to the old hill village of Portiragnes. Building regulations have ensured that Portiragnes Plage has not suffered the same fate as some of its neighbours, becoming over built and over populated, and the village luxuriates in the natural beauty of the area, with glorious Blue Flag approved beaches, pine trees and a very Mediterranean ambience. Pouzolles is a typical wine village, which nestles among the age old hills and vineyards of the Hérault department of the Languedoc-Roussillon region in the central south of France. Historic and tranquil, the village also benefits from a wonderfully sunny climate, one of the best in France. Prades is an attractive French Catalan town that lies just north of the Spanish border, in the southernmost department of France, the Pyrénées Orientales. The town benefits from its location on the confluence of several rivers, and is more green and fertile than its distinctly Mediterranean climate would suggest. The mediaeval village of Puimisson is situated in the Hérault department of the Languedoc-Roussillon region in the central south of France. Pretty and quiet, Puimisson is a traditional circulade village, built in a circular shape to help boost its defences against intruders. Full of charm, Puimisson is still quite unspoiled by tourism and lies amid the vineyards and typically Mediterranean landscapes of the Hérault. Puissalicon is a peaceful mediaeval village that lies in the Hérault department of Languedoc-Roussillon in the south of France. Built as a fortified circulade village, Puissalicon is beautiful and interesting to explore, and sits on a hill at the foot of its ancient castle. The village is surrounded by the vineyards that make the region famous throughout the world, and some excellent wines are produced here. The lovely mediaeval wine village of Puisserguier is found right in the midst of the prolific vineyards of the south of France, between the Mediterranean Sea and the mountains of Languedoc-Roussillon. Its perfect location, sunny climate and authentic ambience combine to make this picturesque village an idyllic spot for enjoying a truly southern French experience. The village of Puivert is found nestling in the foothills of the Pyrénéan Mountains in the Aude department of Languedoc-Roussillon, in the south of France. Surrounded by stunning scenery encompassing lakes, mountains, bastide towns and Cathar castles, within reach of both the Mediterranean coast and the ski resorts, Puivert is a lively, pretty village in a perfect location. Quillan is seen as a major tourist base for the beautiful Upper Aude Valley. It is home to many outdoor activities that occur within the valley. The pretty town of Quissac is found in the central south of France, on the River Vidourle in the department of the Gard. Known for its 17th century church and its lively market, Quissac is charming and typical of the Languedoc region. It is steeped in history and enjoys a way of life dictated by the seasons. The landscapes around the village are glorious, encompassing the pine forests of the Cèvennes Mountains and the Mediterranean vineyards, garrigue lands and olive groves. Remoulins is an old southern French town which lies in the Languedoc-Roussillon region, yet is so close to the Provençal border that it is frequently referred to as being in Provence. The town is typically southern in style and atmosphere, and is set in an unmistakeably Mediterranean landscape. Its most famous feature lies just outside the town, this being the Pont du Gard Bridge, France's most visited ancient monument. The town of Rivesaltes, which lies in the north-east of the Pyrénées- Orientales department of southern France, is an attractive and vibrant town which benefits from a superb Mediterranean climate. Situated just north of Perpignan, the capital of Roussillon, Rivesaltes is perhaps best known for its array of sweet wines, particularly the Muscat de Rivesaltes, popularly drunk as an aperitif in this part of France. The lovely village of Roquebrun is found in the department of the Hérault. Typically Mediterranean, the village lies amidst a landscape of vineyards and cornfields, backed by the beautiful scenery of the Haute Languedoc National Park. The village of Roujan in the sun-blessed south of France, lies just a stone's throw from the Mediterranean Sea and the Bassin de Thau. This charming little village is both historic and unspoiled, yet bubbles with life and makes a wonderful base for anyone wishing to enjoy the riches of this delightful region. Sabran, in the Gard Provencal area of the Gard department of Languedoc-Roussillon, is a delightful community consisting of eight tiny hamlets, set amidst the beautiful countryside of sunny, southern France. Saint Ambroix is a fascinating and charming mediaeval town which lies in Languedoc-Roussillon's easternmost department, the Gard. Blessed with a climate equal to the best in France, a fascinating history and truly beautiful natural surroundings, Saint Ambroix is a town which should be high on anybody's "must see" list. Saint André is a lovely old Catalan village that sits between the sparkling blues and golds of the Mediterranean Sea and the snow-white tips of the Pyrénéan Mountains. The village is close to the beautiful fishing village of Collioure, the cherry producing town of Ceret and just a short drive from the Spanish border. Saint-Chinian is a peaceful town situated in a wine-growing valley. It has its own public swimming pool, and the Mediterranean Sea is only 20 minutes away by car. The surrounding area is ideal for walking or bike rides. The region also offers the chance to try your hand at rock-climbing, fishing, painting, golf, horse riding and kayaking or canoeing. The resort of Saint Cyprien Plage is the beachside area of Saint Cyprien, set in the Mediterranean department of the Pyrénées-Orientales in the south of France. In this land of sunshine, vineyards, olive trees, soaring mountains and salt air, Saint Cyprien Plage represents one of the best opportunities for French Mediterranean living to be found. The seaside town of St Cyprien lies in the far south of France under the brilliant blue skies of the Languedoc-Roussillon. Lively in summer and tranquil in the winter, the resort is one of France's Mediterranean favourites. Not only does it have all the advantages of the seaside and sub-tropical climate of the south of France, but it also lies close to the dramatic peaks and skiing opportunities of the beautiful Pyrenean Mountains. Saint Estève is a charming town with a very Mediterranean air that is found in the sunshine department of the Pyrénées-Orientales in the south of France. Popular and lively, the town offers good amenities and is close to the beaches of the Med, the ski stations in the Pyrénées and the city of Perpignan. The village of St Geniès de Fontedit in the Hérault department in the south of France, is a good sized village in an enviable location, lying just inland from the Mediterranean coast. The Hérault is blessed with a supreme climate, with as much sunshine as the Côte d'Azur, but with less wind. St Geniès de Fontedit is attractive, with old stone houses built around the church, and a living village centre complete with local shops and amenities. Saint Génis des Fontaines is a lovely village that is located in the deep south of France, where the Pyrénéan Mountains meet the Mediterranean Sea, close to the Spanish border. The village has a long history of wine making, and there are several caves and cooperatives nearby where it is possible to taste the wines and to learn about the processes involved in making them. Saint Laurent de la Salanque is a large, attractive market town that occupies a prime position in the south of France, close to the Mediterranean beaches and the prolific vineyards of the sunshine department of Pyrénées-Orientales. The small town of Saint Paul de Fenouillet is situated in a beautiful and dramatic part of southern France, in the foothills of the Pyrénées Mountains and near the Mediterranean Sea. A thriving town, Saint Paul de Fenouillet is surrounded by awe inspiring gorges, vineyards and aromatic "garrigue" (Mediterranean rocky scrubland) whilst being overlooked by the soaring peaks of the mountains with their ski resorts, forests and pretty pastures. St Pierre sur Mer is a well kept secret in the south of France. A friendly little beach resort located on the Mediterranean coast, St Pierre has superb long sandy beaches and a great sunny climate. It lies close to the much better known Narbonne Plage, and although in the guide books it is rarely mentioned, it is every bit as good a resort as its popular neighbour. The town of St Pons de Thomières is situated in the Hérault department of southern France, and marks the invisible line where the climate and vegetation of the dry hot Mediterranean meets the cooler, densely forested mountains. Here you can truly experience the best of both worlds, and in an historic and attractive market town to boot! The town of Saint Thibéry, which sits near the confluence of two rivers, lies in the lovely Mediterranean landscapes of the northern Languedoc, in the central south of France. Full of charm, the village is set on two levels and offers two distinct styles of accommodation. The lower part is the old village, with historical buildings and quaint old streets, while higher up the hill are the modern luxury villas... it's all a matter of choice! Salazac is a small village which is found sitting proudly on a hilltop overlooking the vineyards and hills of the Gard Provencal in north-eastern Languedoc-Roussillon. The village enjoys all the benefits of the fabulous climate and other attractions of the south of France, and offers peace, authenticity and beauty yet with ease of access to the fascinating towns, coast and mountains of this region. The village of Sauvian lies in the central south of France, in the Hérault department of Languedoc-Roussillon. Surrounded by vineyards and close to the lovely Mediterranean coast with its lagoons and golden beaches, the village is picturesque and full of authentic atmosphere. Sérignan is a lively and attractive town that is found in a superb seaside location in the south of France, near the sunny Mediterranean coast. Since the 1960's Sérignan has dedicated itself to a programme of development and sympathetic modernisation designed to attract tourism and to further enhance the quality of life for its residents. Servian is a thriving and authentic wine producing village that is situated in the centre south of France, in the Hérault department of the Languedoc region. Set in the picturesque vineyards of the biggest wine region of the country, the grape and the sunshine that helps it flourish have been the raison d'etre for the villagers for centuries. The town of Sète, which lies in the south of France on the Mediterranean coast, is a colourful and bustling fishing port. Its position in the central south of France gives it the added advantage of being well placed to visit and explore all of France's Mediterranean coastline and also the fascinating and historical cities of the area. Sigean is a colourful little town that lies in the central south of France, very close to, although not actually on, the Mediterranean coast. Although attractively traditional in style, and with a great range of facilities, the town is probably best known for its wonderful safari park and zoo, which is a major attraction for both tourists and locals. Sommières is a fascinating mediaeval town which is found in the Gard department of Languedoc-Roussillon in the south of France. The town has many historical features and lies in the pretty countryside of the Gard, Languedoc's most easterly department, and one which shares much of its character with neighbouring Provence. The village of Sorède lies in a delightful location in the deep south of France, close to the Pyrénéan Mountains where they form a natural border with Spain. This area, known to be one of the sunniest in the whole of France, is packed with history, natural beauty and traditional charm. Sorède might be a tranquil French village like many others, if it were not for the final ingredient that makes this place special... a strong dash of fiery Catalan character. Tautavel is an historic and charming village which is found in the unspoilt countryside of the Pyrénées-Orientales department in the south of France. Lying not far from the Spanish border, and near both the Pyrénéan Mountains and the Mediterranean coast, the village is a delightful spot to holiday or to put down roots in the sun. Thézan lès Béziers is a lovely mediaeval wine village that is found in the Hérault department of Languedoc-Roussillon, in the south of France. Surrounded by the extensive vineyards that are such a feature of the area and the economy, Thézan lès Béziers is close to all the attractions of the region, and makes a charming and well located base for holidays or permanent living in this sunny and historic part of France. Generally considered a desirable area to buy property, Roussillon is relatively expensive when compared with, for example, Limousin or certain parts of Brittany. It is, however, still cheaper than other parts of the Med, for example, the Côte d'Azur, and also, interestingly, tends to be cheaper than its counterpart towns in Spanish Catalonia, on the other side of the border. Property types vary, ranging from beautiful traditional Mas farmhouses to little village houses and even modern villas. The beautiful town of Torreilles is found in the far south of France, not far from the border with Spain. Set beside the excellent sandy beaches of this part of the Mediterranean, Torreilles also benefits from having one of the best climates in the country. Popular with tourists for its lovely long beach, Torreilles also retains a strong sense of tradition and Catalan identity along with bags of character. The little village of Tuchan lies in the hills and mountains of the far south of France, close to the Spanish border. Tuchan is a village dominated by two things: its situation, in some of the most rugged and beautiful countryside of France; and its wine, which is its economic and social lifeblood. Introducing the pretty town of Uzes in the Languedoc Roussillon. Covers the town's location, transport options and provides guidance for those looking for property in the area. Valras Plage is a seaside town located in the south of France, in the department of the Hérault. Once a small fishing village, Valras Plage is now a fully fledged Mediterranean resort, with all the fun and facilities you could hope for. The resort offers over four kilometres of fine golden sand, and has one of the best sunshine records in France. The wine producing village of Valros occupies a privileged location among the lovely landscapes of the southern French department of the Hérault, in Languedoc-Roussillon. Surrounded by the vineyards that are so much a part of daily life for the village, it is also within easy reach of the Mediterranean Sea, the dramatic mountains and gorges of the interior of the region and the historic cities and monuments for which the Languedoc is so well known. Vauvert is a thriving old market town set in the wonderful natural environment of the inland Mediterranean, on the edge of the Camargue and close to the lovely city of Nîmes. Surrounded by the garrigues, vineyards and orchards that characterise the landscapes of this region, yet not far from the sea, Vauvert marries the best of the Languedoc and Provence. The village of Vernet-les-Bains lies in the far south of France, close up to the borders of Spain and Andorra. Catalan in nature, Vernet-les-Bains presents a fascinating slice of life in this unique region, blending as it does all that is best of France and Spain. Vernet-les-Bains is a thermal station, and is as popular with holiday makers for the thermal waters as it is for its beauty and history. Vézénobres is a lovely old hilltop town that is found in the Gard department of southern France. Technically it is within the boundaries of Languedoc-Roussillon, but as the Gard is the most easterly of the Languedoc departments, towns like Vézénobres tend to have more in common with those found in neighbouring Provence. The surrounding landscapes are those typical of this hilly Cevennes area, with Provençal overtones of lavender, vineyards and garrigue (scrub). Vias is perhaps best thought of as a town of two parts, rather than one town with one identity. Situated in an enviable and sunny location beside the blue Mediterranean Sea, Vias has an old town full of history and character, and a lively and modern beach resort to offer... take your pick or get the best of both worlds! The town of Villefort is one of two towns of the same name that are found in the Languedoc-Roussillon region of southern France. One of them is located in the Aude department, but the Villefort of which we speak here is situated in the little known and less visited department of the Lozère, the most northerly part of the Languedoc. The little granite town nestles at the foot of Mont Lozère in the Cèvennes Mountains, and makes a wonderful base for anyone who wants to experience the unspoiled beauty of this dramatic region of France. Villefranche de Conflent is an old walled town that lies in the far south of France, down near the Spanish border, on the confluence of two rivers, the Cady and the Tet. With its all encompassing walls and the River Tet that borders the town along one side, Villefranche is classed as one of France's most attractive and intriguing towns. Villelongue dels Monts is a charming and historic Catalan village that is found in the far south of France, not far from the Spanish border. It is a typically sleepy Pyrénéan village, but it has a good selection of basic shops and services, and its peaceful and beautiful location makes it perfect for escaping the stresses and strains of modern life... whether for a holiday or longer term! The vibrant Catalan town of Villeneuve de la Raho is situated near the city of Perpignan, in the Pyrénées-Orientales department of Languedoc-Roussillon. With all amenities and a colourful culture, the town also boasts a lovely leisure lake offering many water-based activities. Villeneuve lès Avignon lies in the south of France, in the east of the region of Languedoc-Roussillon in the department of the Gard. Once home to important papal cardinals, this fortified town is full of fascinating buildings and is set in typically rocky Mediterranean countryside gazing down onto its famous neighbour Avignon. The village of Villeneuve les Béziers is found on the banks of the lovely Canal du Midi, close to the Cathar city of Béziers in the Hérault department of Languedoc-Roussillon in the central south of France. Its idyllic location, also close to the Mediterranean Sea and the salt lagoons, is only part of its charm, as Villeneuve les Béziers is a very pretty village, equipped with everything you could want for a great quality of life under the southern sun. Villeveyrac is a charming village which lies in the sun-drenched south of France, in the Mediterranean department of the Hérault in Languedoc-Roussillon. The village is surrounded by the vineyards that create the wines for which it is famed, and which form the lifeblood of the local economy. Villeveyrac is close to the inland salt lagoon the "Bassin de Thau", where the wildlife is as spectacular as the seafood! Vinca, a charming little town in the deep south of France, welcomes you with a true Catalan spirit. It lies handily close to the airport town of Perpignan, making it an ideal base for a second home in the Mediterranean sunshine. Considered part of the south-west of France, Languedoc-Roussillon shares the Mediterranean coast with its more affluent neighbours. WHICH DEPARTMENTS ARE IN Languedoc-Roussillon?